“We’re actually projecting this year that the North Pole may be free of ice for the first time [in history],” David Barber, of the University of Manitoba, told National Geographic News aboard the C.C.G.S. Amundsen, a Canadian research icebreaker. It turned out that he was wrong. The 2008 summer minimum turned out to have more ice than 2007’s minimum. But he has a fallback predicton: that the Arctic Basin will be ice free, at least part of the summer, by 2015. This is a much more profound prediction. The North Pole is just a dot on the map, but the Arctic Basin is 4 million square kilometers surrounding the North Pole. This post has been viewed thousands of times on both my website and on the sites of others who have re-posted it. “I propose a friendly wager based on this prediction. I will bet David Barber $1000(US) that the ice covering the Arctic Basin will not be gone anytime before December 31st, 2015. The bet would involve no transfer of cash between myself or Barber, but rather, the loser will pay the sum to a charitable organization designated by the winner. Definition of terms. The Arctic Basin is defined by the regional map at Cryosphere Today. “Gone” means the Arctic Basin sea ice area is less that 100,000 square kilometers, according to National Center for Environmental Prediction/NOAA as presented at Cryosphere Today . Charitable organizations will be agreed upon at the time the bet is initiated. Perhaps you did not see that challenge online – but many other people did. I am now willing to give you two to one odds on the same wager. Are you interested? That’s right. I will put $2000 dollars against Professor Barber’s $1000. It should be difficult for him to turn this down. He can put that $2000 dollars to any good cause that he desires. If this sum is too small, perhaps we can nogotiate something larger. He knows how to find me. But I haven’t had a response yet. One more point: The Arctic Basin is about 4 million square kilometers that roughly surround the North Pole. If the Arctic Basin were ice free, then it would be a pretty good bet that all the arctic regions south of the Arctic Basin would also be ice free. So Barber’s bet that the Arctic Basin will be ice free at some point by 2015 is effectively like saying the entire Arctic will be ice free. 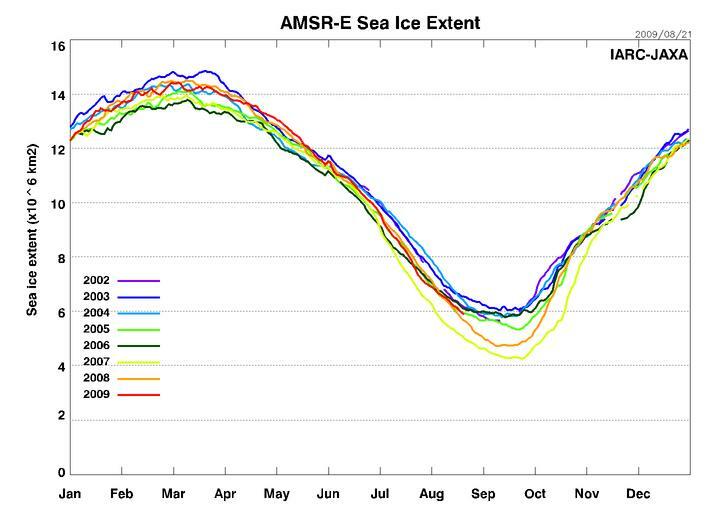 Look at the AMSR-E plots of Arctic sea ice extent below. Anybody interested in taking my wager? Sea Ice extent for the Entire Arctic. If the Arctic Basin becomes ice free, then it is a good bet that the entire Arctic will also be ice free. Sea Ice extent for the Entire Arctic. Ths is a detail from the graph above. If the Arctic Basin becomes ice free, then it is a good bet that the entire Arctic will also be ice free. Why am I making this bet? Because I am concerned about climate exaggerations and the effect they have on public policy makers. It seems quite clear that David Barber was off the mark when he predicted for 2008 “this year that the North Pole may be free of ice for the first time,” because neither the Arctic Ocean, the Arctic Basin nor the North Pole were ice free in the summer of 2008. Same with the summer of 2009, so far. 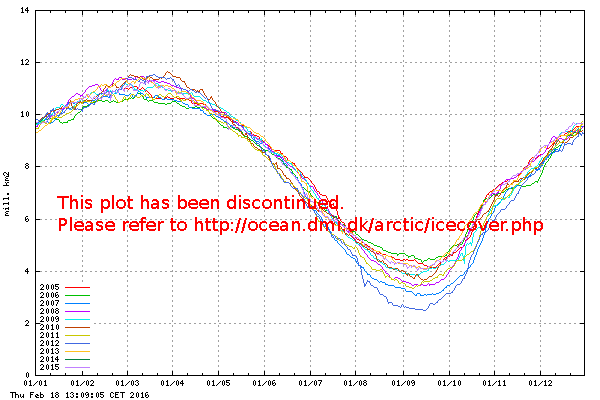 And the Arctic Basin will not be ice free by 2015 either. The good Dr. is full of bs, and you have called him on it. Excellent. Good job calling him on this. If nothing else, perhaps it will make him think twice before making ridiculous statements in the future. 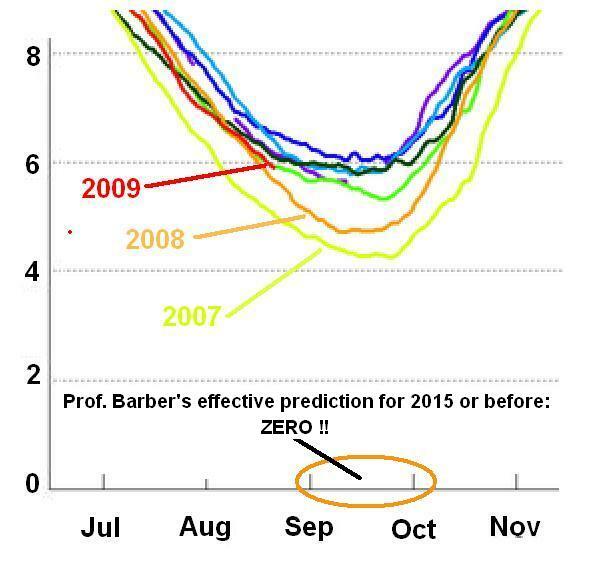 Now on Nov 27, 2009 Barber says it will be ice free between 2015 and 2030. Is he backtracking? I read recently that Barber and his crew have gotten $35 million grant money over the last 5 years.He’ll be back in the Arctic again this September spouting his warmist garbage…rotten ice…it’s worse than he thought it would be….blah, blah, blah. Next, he’ll be on CBC with Peter Mansbridge dwellling on his every word. I remember this page having comments calling you out on your BS…. 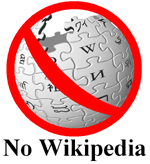 seems the ignorant (you) can’t handle being challenged with peer-reviewed facts…. Are you implying that I have removed critical comments from this page? If so, you are wrong. Please be more specific in your allegation so that I can effectively refute it. Tell me, Kinja, do you think Barber’s prediction of an ice free artic basin by the summer of 2015 is reliable?